Voicemail to email service has double meaning of voicemail email. It can (1) save your voicemails and send them to you as an attachment to an email. AND, it can (2) literally convert the audio of a voicemail message into text which is emailed to you and then you can then read on your cellphone or computer! Sign up for eVoice Receptionist and you now will be able to recieve all your voicemails as email attachments! Your messages are automatically converted into audio .wav files. PLEASE NOTE: This service cannot access old voicemails that exist prior to signing up. 30 Day Free trial! Learn how to download voicemail messages and how to save voicemail to computer all by yourself! 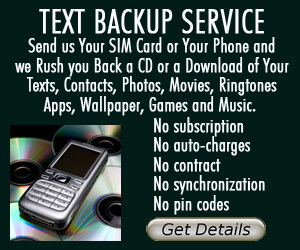 Learn the best way to send a text message from your computer to a cell phone for free. Free tutorial shows how to save text messages to your computer and how to download text messages permanently. With a little research, you can uncover the facts about cell phone radiation and cell phone safety. Other Products and Services We Recommend. Break out of any cell phone contract with Cellswapper! We match individuals who are currently locked into a cell phone contract, with those who would jump at the prospect of getting a short-term contract (as short as 1 month), with no activation fees and a free phone. Unlimited voicemail capacity to allow for voicemail overflow with no contract required. If your voicemail messages are COMPLETELY full and there are no more room for more messages, you need this service in the meantime while you arrange to have your messages permanently saved, so you won’t miss any more important messages! Step-by-Step tutorial shows how to convert POP3 computer-based email accounts to web-based email service. Save iPhone voicemails to Your Computer as an mp3 or Burn to a CD.